Mid-October is when I put a request in at the library for this book. It took 2.5 months to get to me and it came all the way from Ottawa. But it was worth it. It is 1867 Finland, and the population is suffering from a severe food shortage. As a mother and her children make their way across the frozen landscape looking for a better life (or even a scrap of food), they come across a myriad of people. Some of the people are kind and generous, sharing what little they have (and they all had very little). Some are stingy and suspicious of everyone. But most fall somewhere in between. They are real. They want to help, but have so little for themselves. They want to help, but know that there are so many others who need it as well, and where do you draw the line before you have nothing left? Many are suspicious by nature, but others have been stolen from before and can’t afford to have it happen again. I couldn’t help but wonder, what would I have done? He thinks of the woman left lying in the snowdrift. How the snow fell over her, in the end, not tenderly tucking her in, but devouring her, like a raging sea dragging a castaway into its depths. One thing that struck me while reading this book is the strong will to survive. The mother in the story just keeps going and going, because she has no other choice. She follows the light at the end of the tunnel and hopes that it gets her where she wants to go; against all odds, with nothing in her stomach, with two children who have nothing in their stomachs, in the snow, on foot, alone. This book is bleak, but there is hope; in humanity, and in the spring that is to come. It does her good to hear another person speak. When she has to exert herself and concentrate on listening, she momentarily forgets the cold and the hunger. No matter what the other person is saying, as long as he is addressing her. Then she remembers that there are other people in the world, and that people still talk to each other. And one day, maybe, there will be talk of things other than bread, the lack of it, or hunger and diseases. The child’s laughter ploughs a path through grey despair. Hopeless, yes, but a chance all the same. 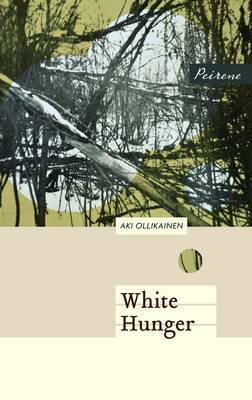 Other blogger reviews of White Hunger can be found here. This reminds me of a book about a woman who homesteaded in Saskatchewan but was abandoned by her handsome husband who sold their property and left her destitute. Unfortunately I didn’t blog it and can’t remember the title. Does anyone else know it? I found it. It is Wild Rose by Sharon Butala. It is worth reading if you like this genre of strong determined women struggling against all odds. Aha! I’ll have to look it up. Oh, I do like it! Thanks for the recommendation, Brian! The Outlander is good – I read it when it first came out and loved it! I have this book on my phone ready to read. I think it will be my next Peirene Press read – it sounds excellent. I hope you enjoy it! What ones have you already read? The Mussell Feast, Portrait of the Mother as a Young Woman, Stone in a Landslide, Beside the Sea and The Blue Room. Beside the Sea is my favourite so far. Amazon Australia had a sale on Peirene books last year and I have a copy of most of them. I plan to read (savour) them slowly over time. Have you read many of them? White Hunger was my first one, but it won’t be the last. I have Beside the Sea and The Looking-Glass Sisters on my list, but the others are new to me. I’ll have to check them out! When I first started seeing the reviews of the Peirene books, this is the one that caught my attention, although I’m sure I will be reading some of the others as well. Glad to hear that this didn’t disappoint. Odd to say this of such a harrowing book but I was struck by the beauty of the language. A triumph for the translator! I’d echo Jacqui’s comment – it’s a book that stays with you for quite some time and must have seemed all too believable in the depths of a Canadian winter. It seemed so believable. I could feel the blustery wind filled with the powdery snow hitting her in the face as she walked, blowing down the neck of her clothes (which were probably not warm enough – even the down-filled parkas we wear now sometimes don’t feel warm enough). I read and reviewed one of the others in this series (Peirene books are issued as trios), The Looking-Glass Sisters by Gøhril Gabrielsen, and enjoyed it very much. I can see the connections with this one in terms of tone and content — I’d like to read it as well. Sounds fascinating, Naomi. I hadn’t heard of it before. Interesting idea that as long as people can still talk to each other, as long as a child can find a reason to laugh, it’s possible to believe the future will bring something better. The hopeful quotes were the ones that caught me attention the most. They had to grab onto any possible hope there was. I love books that make you think about the “what would I have done” questions! And the quotes you shared are gorgeous! And, it wasn’t really until I was writing my review that I started to wonder what I would have done. The characters seemed so real that you realize that you could very well have been one of the stingy ones not wanting to give up their last loaf of bread. I hope I wouldn’t be, but who can really blame them? Oh good! I’ll be interested to hear your thoughts on it. It’s a good one to fit in between two longer books. Yikes! It sounds bleak, but very good. It reminds me a bit of Burial Rites, with that stark focus on just how hard it is/was to survive the winter. You’ve reminded me that I haven’t read Burial Rites yet! I do love winter survival stories. Am I afraid that someday I might have to rely on all these stories? I hope not, but I suspect you’re pretty well equipped! You waited so long, but have so little to say, Naomi! I did want to say more about the senator and the few other characters who were relatively well-off, and their part in the book, but I wasn’t clear enough on what I was trying to say that I just decided to cut it out and keep the parts that were the most meaningful to me. I find some books are harder to write about than others, and this was one of them. I hear you! I really struggled with my most recent review, but after several drafts, I realized the book was just hard to explain. This sounds fantastic, Naomi. I love when stories double up as “human studies,” if that makes sense. It’s interesting to think about all of the different reactions people have to one particular event (in this case, food shortage). I’m not sure what I would do either. I’d like to think that I’d share whatever I had. The survival aspect of this book sounds fascinating as well. Our bodies are so surprisingly fragile and resilient all at once. I think one of the reasons I like survival stories is because I’m interested to know just how far we can be pushed. And, because we’re all different, we all will react differently to the same survival situation. Wow sounds pretty bleak. This poor woman. I haven’t heard about this book, what a survival story. As long as there is hope — I’d be interested in it. That writing is absolutely beautiful! Not sure I could stand the bleakness for very long, but the writing is extremely tempting. Good to know it’s not too long :). Perhaps I’ll leave it for a spring read so that I won’t be reading about snow devouring someone in the middle of an Edmonton winter. I do wish that I was re-reading The Outlander. I remember loving it, but have forgotten most of the reasons why. I do know I love stories about running and chasing and hiding, especially if the runner and hider is a woman. I will have to listen to that podcast for sure! Let me know if you decide to give White Hunger a try! This sounds inteeeeense. I’m trying to read more historical fiction, so I might check this one out. Fiction is the best way to learn about stuff. I had never heard of this famine before.